Analysis HP's first calendar 2014 quarter storage revenue downturn was a blip, according to the global head of its enterprise group – though analysts at IDC may not agree. Bill Veghte, exec veep and GM of HP's Enterprise Group, was speaking about the calendar Q1 numbers that co-incide with HP's second fiscal quarter. He told us the worst three months for juicy high-end storage for some years "was nothing more than a kink", before adding "we took share in storage". Why did this blip happen? "[Our specialists] that follow the storage market say this happens periodically, this is not the first time, and they would generally attribute it to a set of inflection points - flash, some disk drive changes, and then of course cloud." 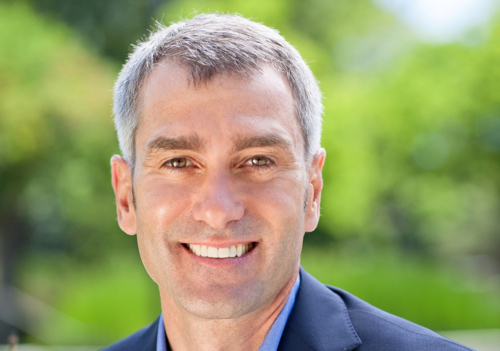 IDC in its Storage Tracker thought that the first calendar quarter of 2014 saw a virtual buyers' strike for high-end storage, which would chime in with Veghte's statement. The beanie said the market as a whole declined 6.9 per cent year-on-year in revenue terms. IDC said HP's revenue share for total storage products (internal and externally attached storage) declined by 8.8 per cent – more than the market. Only NetApp gained share in the quarter, according to IDC's number crunchers. 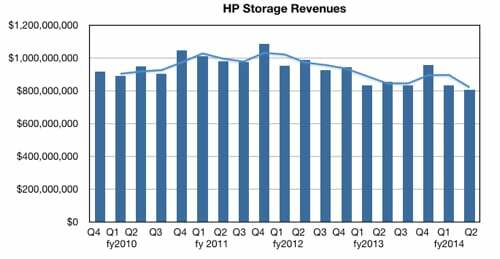 What can we deduce from a chart showing HP's quarterly storage revenues? Since a revenue peak in the fourth fiscal 2011 quarter of $1.1bn, they have decreased - and a trend line demonstrates this. Fiscal 2013's fourth quarter stands out - $960m, better than the $950m in the earlier year. But otherwise the annual quarter storage revenue compares show what looks like a downward trend.